"I'm tired of buying this at the store, so I decided to make my own. In my opinion, this is the best way to prepare potatoes for a typical breakfast. This recipe lasts a long time in the freezer. Just pull the bag out of the freezer and toss as much as you want onto a hot pan or griddle. Add more vegetable oil when cooking if needed. Enjoy." Place the potatoes into a large pot and cover with salted water. Bring to a boil over high heat, then reduce heat to medium-low, cover, and simmer 10 minutes. Drain, then set aside until cool. Once cool, cut into 1/2-inch dice. 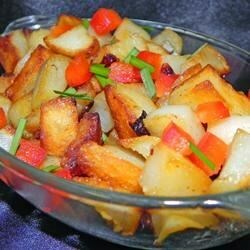 Combine the potatoes, green bell pepper, red bell pepper, and onion in a mixing bowl. Drizzle in the vegetable oil, and gently stir until evenly coated. Spoon the mixture into resealable freezer bags. Store the mixture in the freezer. To prepare, cook the frozen mixture in a nonstick skillet over medium-high heat until crispy and golden brown, stirring occasionally, about 20 minutes. See how to put a creamy, flavorful twist on regular mashed potatoes. This recipe is great! However, I can't leave well enough alone and I add 2 teaspoons seasoned salt with pepper per bag!